50,000-Acre Usal Redwood Forest Conservation Transaction Finalized Protects America’s Largest Non-Profit Owned Working Community Forest. The Redwood Forest Foundation (RFFI) is pleased to announce that on October 27, 2011 we closed the transaction for the sale of a conservation easement on our 49,576-acre Usal Redwood Forest to The Conservation Fund and 957-acre fee sale of the Shade Dell parcel to Save the Redwoods League. Through these transactions, RFFI and our partners have succeeded in protecting a forest landscape that covers a land area almost twice the size of the city of San Francisco. The ambitious and complex transaction was completed by the support of a strong coalition of national and local elected officials, conservation organizations, industry leaders and committed regional residents. This landmark transaction will permanently protect one of the largest non-profit owned ‘working forests’ in America. RFFI will continue to own and manage the Usal Redwood Forest for the benefit of the region. This easement sets standards in place that protect the forest in perpetuity, regardless of its ownership. The easement establishes a fundamental conservation scenario that prohibits development and subdivision. The terms of the easement impose a 2.9% inventory harvest limitation; they require forest stewardship certification and transitioning to uneven-aged management over a 50-year period. These permanent standards will be monitored by The Conservation Fund as the easement holder. Over time RFFI hopes to grow both the conservation practices and economic benefits of the Usal Redwood Forest, located on the Mendocino-Humboldt county line, as it makes good on its financial obligations. The Conservation Fund acquired the easement through a $19,500,000 grant from the California Wildlife Conservation Board and a $500,000 grant from an anonymous party. This transaction along with the previously approved $5.5 million Shady Dell parcel sale to Save the Redwoods League insures that Usal Redwood Forest will remain a working community forest. The sale of the Shady Dell parcel assures permanent protection of a 957 acre coastal parcel that contains windswept, medieval ‘candelabra’ redwoods and public access to the Lost Coast, the longest road-less area in the lower 48 states. This momentous transaction assures that Usal Redwood Forest will remain, in perpetuity, a working community forest for the economic and environmental benefit of our communities. RFFI’s mission includes their commitment to investing the excess revenue that will eventually be generated from the ongoing sustainable harvest back into the community. RFFI applauds California’s Wildlife Conservation Board and California Coastal Conservancy strong support for this project. Their support for this innovative model of forest financing and management conserves a large working redwood forest that holds promise for regional and global impact due to the climate change implications of large landscape conservation, economic impact and replicability of the model. RFFI also acknowledges the great work of our partners at The Conservation Fund and the Save the Redwoods League for their leadership and diligence in executing this important conservation transaction. RFFI is grateful for the expert guidance from US Forest Capital who served as our lead advisor on these complex conservation transactions. Thanks to the Walker Foundation who recently provided funding for this expert consultation. The Campbell Group that serves as the local timberland manager has been integrally involved in the transaction from its outset. Most importantly, RFFI thanks all of our supporters, who worked so hard and tirelessly in support of the easement. Your help made a difference! RFFI has just passed another major milestone in carrying out their mission to acquire and manage redwood forest land for the ecological, economic and social benefit of the region. RFFI, as an organization, will receive no funding from this transaction. The funding will be used to reduce the debt on the property, an innovative financial strategy that utilizes private capital that leverages public dollars for conservation investments that benefit the common good. RFFI will need volunteers and financial support that they can assure the region benefits from the richness of this working community forest. 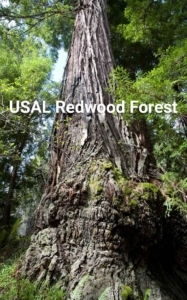 For more information about this landmark transaction ro the redwood Forest Foundation, please visit www.rffi.org. (1) Roosevelt Elk at Usal Creek, coastal redwood forest in the background.